I am so excited to have Hilary Grossman, author of Dangled Carat, on the blog today for an interview! 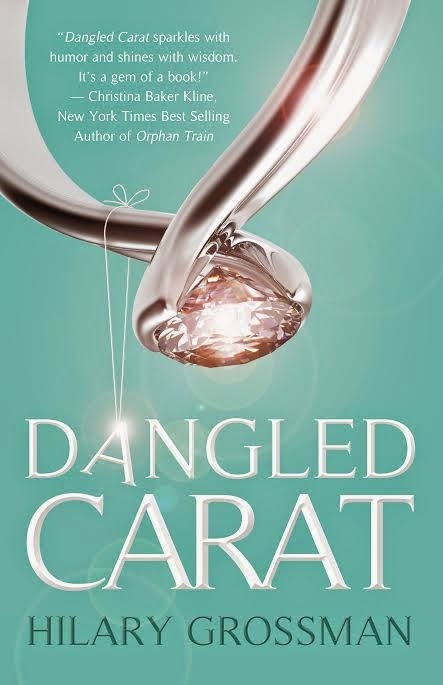 Dangled Carat is Hilary's true-life chic lit story about dating a commitment-phobe and has received endorsements from Kirkus Reviews as well as renowned authors Christina Baker Kline and Meredith Schorr. Please enjoy the interview and continue on for more information about Dangled Carat and author Hilary Grossman! Hi Hilary and thank you for stopping by A Literary Vacation! Hi Colleen! Thank you so much for welcoming me to your blog! I am thrilled to be here. Your novel, Dangled Carat, is about a woman trying to deal with a man who seems unable to commit to her. This could lead to a really emotional story or one that is more fun and light. Can you tell us a little more about the novel and what sort of story we can expect? Although there are some emotional aspects to the story, Dangled Carat is a fun and lighthearted read. It is truly a romantic comedy that explores what goes on in a girl's head during a relationship. Usually, when a woman is involved with a commitment-phobic man, she has to pressure him to take their relationship to the next level. In my book that didn't happen. Instead, all of Mr. Commitment-Phobic's friends and family members did the dirty work for her. And these characters pulled out all the stops, including throwing multiple faux engagement parties for the couple - hence the title. The carat kept being dangled :). I noticed that Dangled Carat is your "true-life chic lit story". What made you want to use that personal experience to write your story? Have you written any other stories based on your life? Where else do you draw your inspiration from? Yes, Dangled Carat is a true story. And everything in the book really did happen to me. It's funny, as I was living this comedy of relationship errors, I always thought to myself it would make a great book. I vowed that one day I would write it. Besides the fact that I knew my story would be entertaining, I wanted to share my story in the hopes that I could help others in the same situation. Dating a commitment-phobic person isn't easy. Everyone in your life is constantly bombarding you with unsolicited advice and opinions. You are left wondering if you should follow your heart or listen to your friends' advice. My wish has come true! Since the publication of the book, I have received so many emails and social media messages from women who also were/are in relationships with commitment-phobic men. all of these ladies have told me that my story has helped them! I haven't written any other stories based on my life, but I have been blogging for over five years. Except for when my cat steals the show, my posts are mostly humorous tales about daily life and how experiences shape us. As for inspiration, I am a huge people watcher. I often joke that I wonder if I find absurdity or if absurdity finds me. I also noticed that beyond your career as a writer you are also the CFO of a beverage importer. You must be busy! How do you balance your writing and your "day job"? What does a typical day in your life look like? I sure am busy! My two careers couldn't be further apart, and that is why I think that I enjoy both of them so much. I have to be very serious and tough during the week. I manage a team of twenty professionals and I am also responsible for the company's finances. It is extremely stressful! Writing is the opposite. It takes me away from the week's pressure. It helps me relax and allows me the opportunity to be laid back, creative and funny. My typical day is a blur. I wake up at 5:30 each morning (including most weekends). As I mainline coffee I am "Author Hilary". I blog, I hit all the social media sites, and answer personal emails. I make sure to work out at least twenty minutes every day before work. As I exercise I am either answering work emails or playing on social media. Although my office is only sixteen miles away from my home, my commute is at least an hour long. About twelve hours later I return home. Unfortunately, I can't look at a computer anymore at that point, yet alone write. I save all my writing for the weekends, often spending almost the full day typing away on my mac. A lot of authors have become huge on social media, not only promoting their work but interacting with their readers and offering up giveaways, book recommendations, etc. Are you a big proponent of using social media in this way? I sure am! Blogging is my first social media love. I am still in awe of the friendships I have made as a result. But I also have a blast spending time on Twitter and Facebook talking to people. I have met so many amazing people thanks to social media. I honestly don't like to promote my work on social media, although I do have to. I much prefer to just have conversations with others. I love participating in Facebook parties and doing giveaways. In fact, I just had a 40 book Valentine's Day giveaway on my blog, which was so much fun! Many authors seem to be big readers as well as writers. Have you read any outstanding books lately? If not, are you looking forward to reading any in particular? Right now I am reading Tess Thompson's new book Duet For Three Hands and I am beyond loving it. It is one of the best books I have read in quite a while. I am looking forward to reading Jen Lancaster's new memoir, I Regret Nothing. She is my favorite author, and I love all of her books. In fact, if it wasn't for her, I think Dangled Carat would still be a dream instead of reality. Before reading Bitter Is The New Black I didn't know what a blog was. That book motivated me to create my own blog and start writing. Are you working on any other books now? What can your readers expect next? I am actually finishing up my second book and getting ready to send it off to the editor. This time the story is completely fiction and I am having so much fun writing it. It is about a mother and daughter whose relationship has been destroyed by secrets, lies and misplaced blame. But it also has a very chic lit twist. Oh your new book sounds juicy! I'm looking forward to reading more about it. Thank you so much, Hilary, for taking the time to stop by and tell us all about your book and your life as an author! "Dangled Carat sparkles with humor and shines with wisdom. It is a gem of a book.” - Christina Baker Kline - New York Times Best Selling Author of Orphan Train. Hilary Grossman dated a guy so commitment-phobic that she was able to write a book about their relationship. She has an unhealthy addiction to denim and shoes. She loves to find humor in every day life. And she likens life to a game of dodgeball - she tries to keep many balls in the air before they smack her in the face. 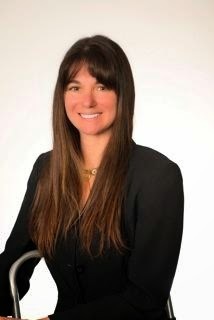 When she isn't writing or blogging she is the CFO of a beverage alcohol importer. She lives on Long Island. Read more about Hilary Grossman's life on her blog, www.feelingbeachie.com, or connect with her on Facebook or Twitter. Thanks again for having me over, Colleen! It was great chatting with you! It was completely my pleasure :)!!! Thank you Hilary!